Bag yourself a Casino like Gary's. 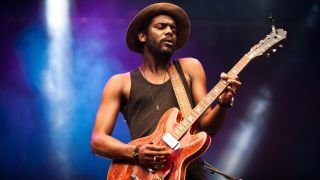 Epiphone has announced two giveaways for April, including the chance to win an Epiphone Casino signed by Gary Clark Jr.
All you need to do to get your hands on a Casino - just like the one that's often found in the hands of the Texan bluesman - is head over to the Epiphone website, sign up for the giveaway and cross your fingers. Also up for grabs from Epiphone this month are a clutch of Les Paul Ukuleles, the last word in tiny rock and roll. Head over to the sign up page to register for a chance to win. For more information visit the official Epiphone website.